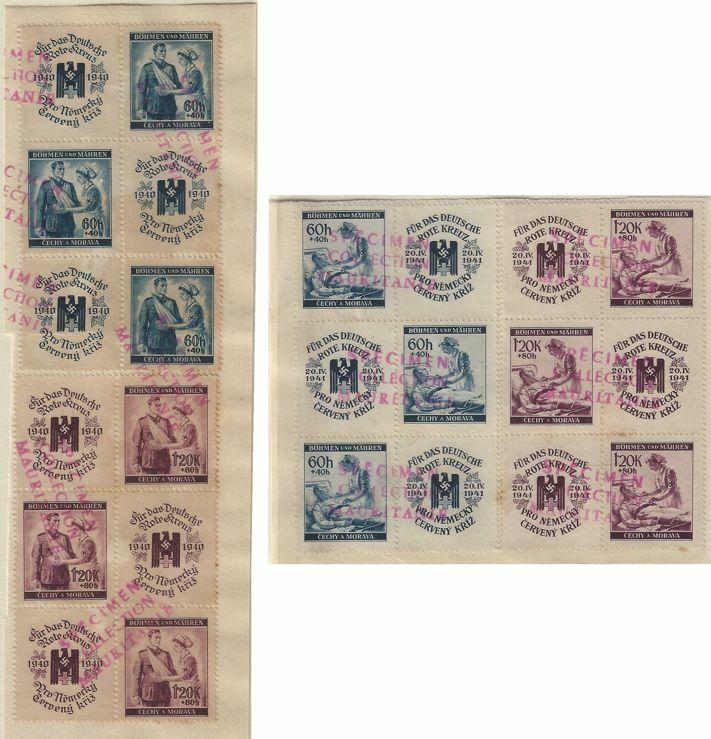 1939 stamps of Czechoslovakia overprinted 'BÖHMEN u. MÄHREN' set of 19. Mi 1-19. 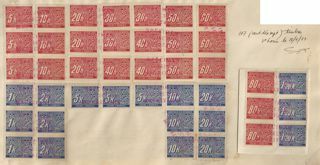 Each in a strip of three affixed to part of archive sheet and cancelled 3-line SPÉCIMEN / COLLECTION / MAURITANIE - UNIQUE items from the Mauritania Post Office UPU specimen collection. 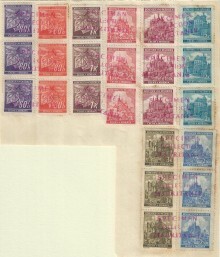 1939 definitive set of 18. Mi 20-37. 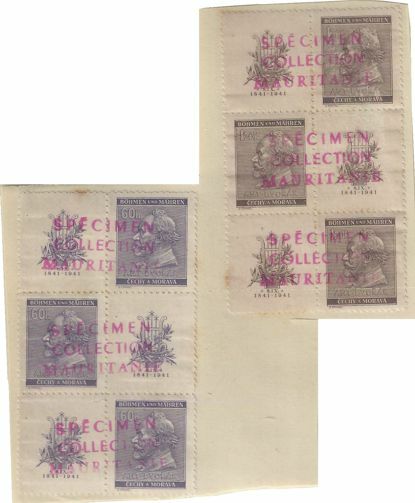 Each in a strip of three affixed to parts of archive sheet and cancelled 3-line SPÉCIMEN / COLLECTION / MAURITANIE - UNIQUE items from the Mauritania Post Office UPU specimen collection. 1940 new designs and denomination set of 4. Mi 38-41. 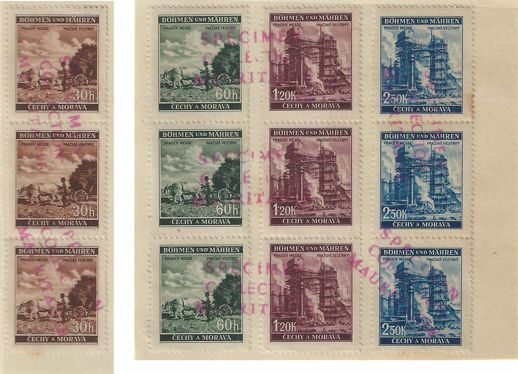 1939 Newspaper stamps set of 9, 10H bulk delivery stamp, 50H violet-blue bulk delivery stamp and 50H carmine postage due stamp. Mi 42-50, 51, 52 and P15. 1940 and 1941 Red Cross sets of 2. Mi 53-54, 62-63. 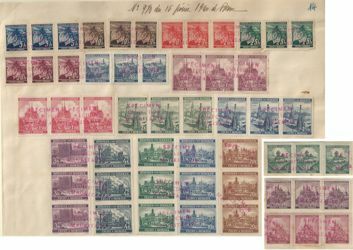 All in strips of three affixed to parts of archive sheet and cancelled 3-line SPÉCIMEN / COLLECTION / MAURITANIE - UNIQUE items from the Mauritania Post Office UPU specimen collection. 1940 set of 7 and 1939/42 issue 3K and 4K new shades. Mi 55-61, 33b, 34b. 1941 30H new colour. Mi 64. 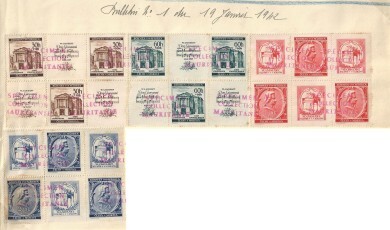 Strip of three affixed to part of archive sheet and cancelled 3-line SPÉCIMEN / COLLECTION / MAURITANIE - UNIQUE item from the Mauritania Post Office UPU specimen collection. 1941 set of 8 in revised design Mi 65-72. 1941 Dvorak set of 2. Mi 73-74. 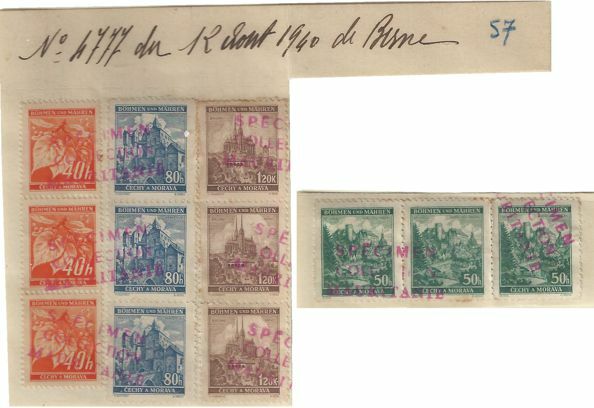 Both in a strip of three affixed to part of archive sheet and cancelled 3-line SPÉCIMEN / COLLECTION / MAURITANIE - UNIQUE items from the Mauritania Post Office UPU specimen collection. 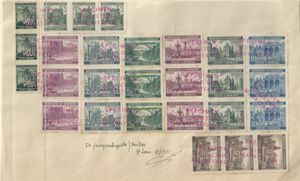 1941 Prague Fair set of 4. Mi 75-78. 1941 Mozart set of 4. Mi 79-82. 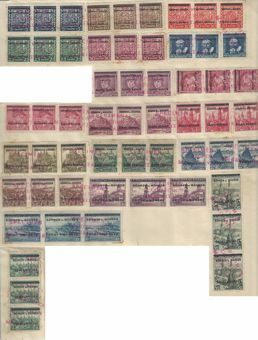 1939/40 Postage Due set of 14. Mi P1-14.